Mick Strider never thought he would own his own knife making company--it just sort of happened that way. Strider Knives became so popular that the company grew out of control before he knew it. The goal of Strider Knives is to build knives with the focus, intent and integrity required to breathe fire into every blade. 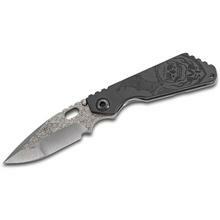 See production Strider Knives as well as Duane Dwyer's Custom Knives.